2018 has been an exciting year for the Branson Regional Arts Council. After moving into our new home venue of the Historic Owen Theatre, we produced workshops, educational events, film presentations, and 9 major theatrical productions with over 8,500 patrons attending throughout the year. An estimated 100,000 patrons passed through the Branson Convention Center Art Gallery, and we were honored to be the recipients of the 2018 Charity of the Year award from the Branson Lakes Area Chamber of Commerce. We thank our hundreds of volunteers who helped in so many ways. Our volunteers include visual artists, actors, set builders, ushers, concessions, box office staff, cleaning crew, and more. In 2018 BRAC received financial Assistance from several sponsors including the Missouri Arts Council and from major donors such as Mrs. Jean Cantwell, Herschend Family Foundation, and Mrs. Barbara Cohn. Our Benefactors included Anne & Mac McGregor, Dr. Arthur & Kim Hale, Marty Schmitt’s Art That Rocks For U, Titanic Museum Attraction, Branson Dental Center, and a new benefactor The Tracks Family Fun Parks. Our Business Patron was Martin Dingman, and our Business Sponsors included Greg & Roz Slavik, Silver Dollar City, Peter Engler Designs, Jim & Jennifer Justus, Doug & Nileen Little, Nathan & Darla Howe, and Michael Horn Attorney at Law. 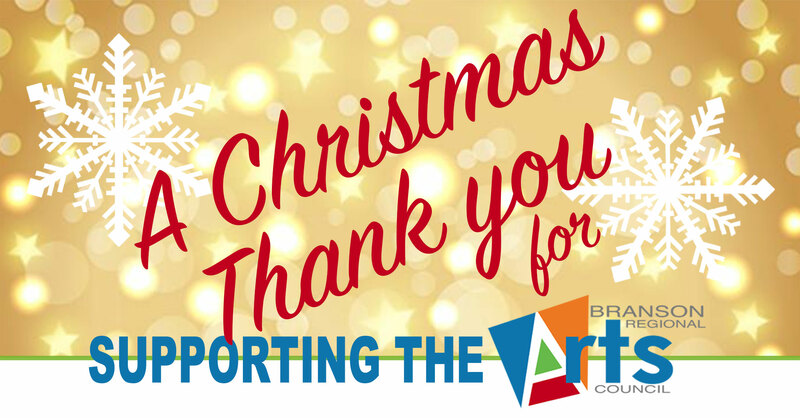 We also thank our many Buy-A-Seat Donors, Tri-Lakes Board of Realtors, and the hundreds of Branson Regional Arts Council members. We must include a special thank you to our 2018-2019 Board of Directors: Lisa Murphy (President), Kim Hale (Vice Pres), Heather Douglas (CFO), Darlene Graham (Secretary), Clint Cross, Hayden Head, Marty Schmitt, Bonnie Herrmann, Dr. Art Hale, Tina Cool-Anderson, Barbara Walker, Lea Trimble, Rick Uebel, Roz Slavik, and Darla Howe. Also two members who went off the board this year, Patty Slicer and Patti Sanders. Special thanks to: our attorney Harry Styron, Ron and Diane Mathes with the Historic Owen Theatre, and Marc Mulherin and the staff of the Branson Convention Center who assist with Art Gallery that we promote on behalf of the City, and finally the City of Hollister for all their support with our Shakespeare In The Park productions. Local area media has been terrific in regards to helping us spread the word to our community. They include the Branson Tri-Lakes News, Branson Independent, Springfield News Leader, Springfield Business Journal, Taney County Times, Stone County Gazette, area radio stations including KRZK, KHOZ, KLFC, KSMU, and local television stations KY3, KOLR-10, and The Vacation Channel. We are also proud members of the Branson Lakes Area Chamber of Commerce, Table Rock Lake Chamber of Commerce, and the Hollister Chamber of Commerce. Visit our website BransonArts.org for info on Memberships, Season Passes, or how to “buy a seat” at the Historic Owen Theatre. Thank you for a tremendous first season at the Historic Owen Theatre! Merry Christmas and Happy Holidays to everyone! 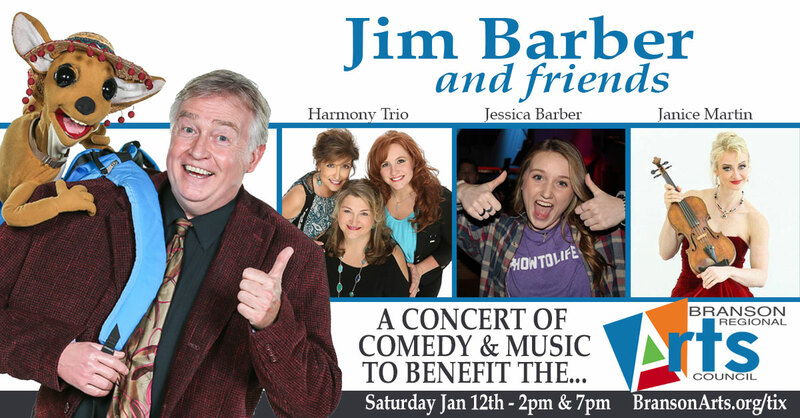 Ventriloquist and comedian Jim Barber will be presenting a concert of comedy and music on Saturday, January 12th at 2pm and 7pm at the Historic Owen Theatre. The event is a benefit show with 100% of the proceeds going to the Branson Regional Arts Council. Advanced reserve tickets are $14.95 (Adults 18+), and $9.95 (4-17) and can be purchased online at BransonArts.org/tix. A small service charge applies to all ticket sales. Sharing the stage with Jim will be his friends Melonie Brown, Babette Fogle and Aloha Post who perform together as Harmony Trio, as well as the multi-talented arial violinist Janice Martin from A Janice Martin Cirque Show appearing at the Americana Theatre in 2019. 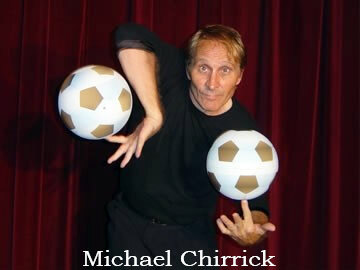 Jim’s 17 year-old daughter Jessica Barber will also be singing in the evening show only, as well as a special appearance by internationally acclaimed juggler Michael Chirrick. Jim’s unique approach to the art of ventriloquism and his unusual vocal skills have earned him the reputation as one of the most original ventriloquist acts in the world. He has been featured on many national television shows, most notably, the Late Show with David Letterman. Jim’s career started in Minneapolis, MN where he co-hosted a local children’s television show (Breakfast with Casey Jones) while attending college at the University of Minnesota. During that time, he also entertained for military troops as host of a USO variety show all across the United States and several Mediterranean countries. Jim then moved to Nashville, TN as a featured performer aboard Opryland USA’s General Jackson Showboat, for two seasons, before setting out on a ten-year tour of comedy clubs and colleges across the country. This led to an invitation to come to Branson as the featured comedian in the Glen Campbell Goodtime Show in the mid-90’s. Jim went on to perform at the Kirby VanBurch Theatre, Osmond Family Theater, Jimmy Osmond’s American Jukebox Theatre, and eventually a 10-year run at the Hamner Barber Theatre. In 2017 Jim accepted the role of Executive Director of the Branson Regional Arts Council and has since devoted his time and energy to working with a large group of talented volunteers who, together, are developing new and exciting community arts programming for all residents in the Branson Tri-Lakes area. Ring in the New Year with an incredible show, fantastic food, delicious beverages (including wine and champagne), amazing prizes and auction items, party favors, masquerade masks (for early ticket purchasers) and lots of surprises. 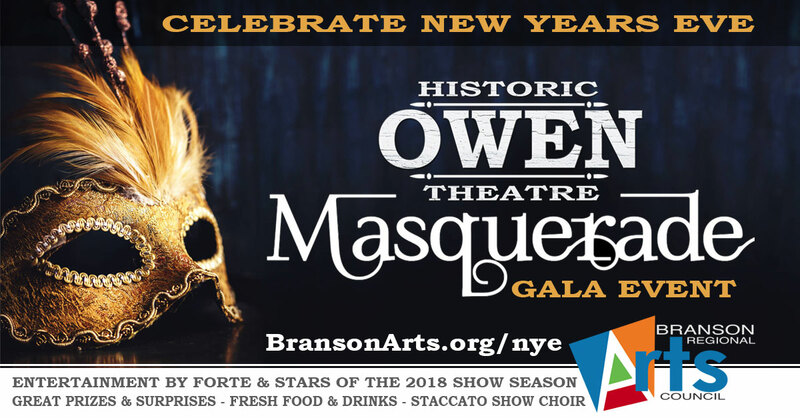 The Branson Regional Arts Council is winding up our FIRST YEAR at the Historic Owen Theatre with an unbelievable event you won’t want to miss! This is a perfect event for singles, couples, or groups who want to celebrate in one of Branson’s most historic venues, the Owen Theatre. We are producing theatrical performances that will feature highlights of this year’s productions as well as next year’s shows. Our BRAC Show Choir STACCATO will perform, as well as stars from our 2018 season of musical theatre shows, plus a special performance from the professional acting troupe Forte’, with another of their spectacular cabaret shows with a Masquerade theme! Lots of fun and surprises! The entire event is $19.95 (plus service fee) per person, and proceeds benefit the Branson Regional Arts Council. Seating is limited, so please get your tickets soon!